The great movements of Holy Poverty of the Church could be said to be a restoration of this great discipline which the Holy Fathers of the Desert practiced. “So likewise every one of you that doth not renounce all that he possesseth, cannot be my disciple.” Luke 14:33 Truly this was the word of our Lord Jesus Christ that inspired such discipline and deprivation in the Lives of these athletes of God. Such stories can bring discouragement to us, who are less perfect than these Holy Men. Yet, when we consider the fact that they were “Gods Athletes” we should ask ourselves if we should feel discouraged by not being able to run 10 miles, or lift 200 pounds if we had never trained for it. These stories provide us with a look at perfection so we can strive manfully after it. Running 10 miles or becoming detached from all that ones owns (perhaps even living in destitution) starts with walking a mile or eating out less and giving away our old clothes. With time, discipline and Gods grace we will become strong in virtue. We have hope of becoming true disciples of our Lord Jesus Christ, when we take one step at a time towards perfection and keep moving forward. 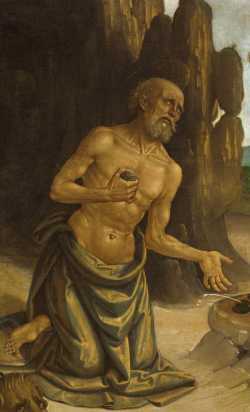 Image Saint Jerome in the Wilderness by Bernadino Pinturicchio in the Public Domain edited by Alleluia Audio Books.